All Green Valley Lake homes currently listed for sale in Green Valley Lake as of 04/24/2019 are shown below. You can change the search criteria at any time by pressing the 'Change Search' button below. If you have any questions or you would like more information about any Green Valley Lake homes for sale or other Green Valley Lake real estate, please contact us and one of our knowledgeable Green Valley Lake REALTORS® would be pleased to assist you. "Constructed by a contemplative contractor for his family, the 'Eagle House' burned to the ground in the 'Slide Fire' of 2007 shortly after completion. Rising from the ashes is the 'Eagle-Phoenix,' a larger, lighter and more fire-resistant version of the former estate. 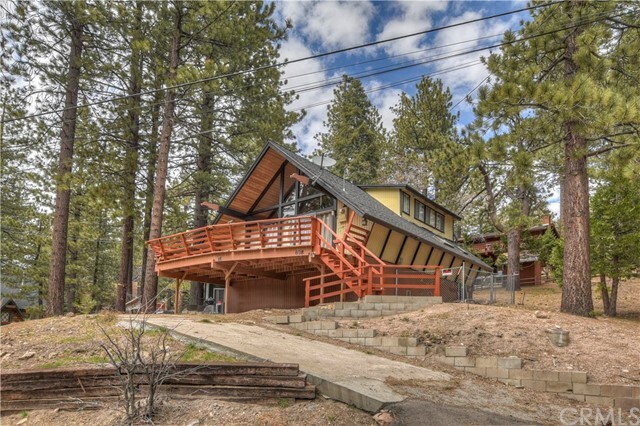 This architectural beauty has wings that converge to a 23-foot high great room that offers incredible views of the sky and forest which include Lake Arrowhead and the vast high desert. This home is one of a kind and sits on nearly 2.5 acres. It's one of only seven other properties in the area known as 'Trails End Estates,' which is North of Green Valley Lake. This property is not for everyone - you have to earn its reward. A 3-mile gorgeous journey on a dirt road delivers you to an awe-inspiring natural setting of solitude with priceless view of Southern California. The owner just finished installing a 400-ft deep water well. Serious buyers are encouraged to schedule a viewing." "Location, Location, Location. 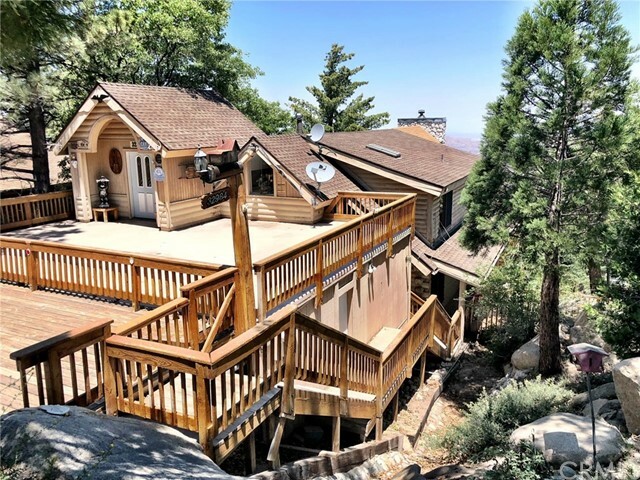 This Beautiful Custom one of a kind Mountain home has Spectacular Panoramic views of the City Lights below, Lake Arrowhead, Desert, Mountains, Old Ski Hill, National Forest and sits on over 1/2 an acre that's surrounded by boulders and trees for your privacy. This level entry home features Living room with High vaulted ceiling, wood burning stove, sliders that leads to the impressive deck that would be wonderful for entertaining and is an open flow to the kitchen and dining area and plenty of windows that bring in the natural light. Bedroom and a full bath, upper level is a look out room that can be an office, reading room or another sleeping area. Lower level has two bedrooms one with a private entry, 3/4 bathroom, laundry area and a over-sized two car garage with excellent level parking. 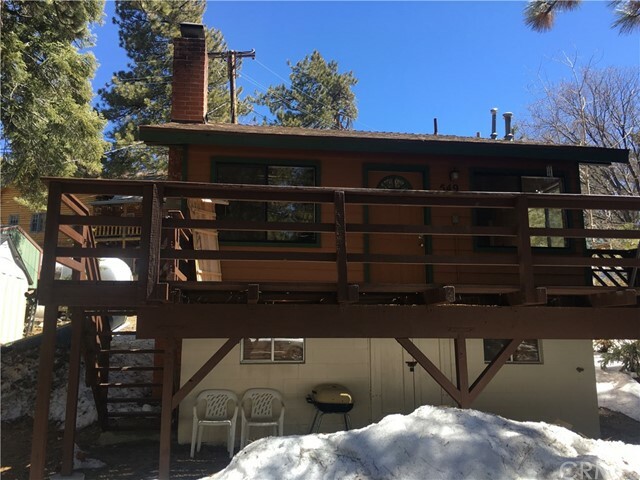 You will love this mountain home.."
"WONDERFUL LOG CABIN THAT FEATURES 3 BEDROOMS, 2 BATHROOMS, KITCHEN HAS BEEN COMPLETELY UPDATED WITH GRANITE COUNTER TOPS, NEWER APPLIANCES, EATING AREA AND NEWER CABINETS. BATHROOMS HAVE NEWER VANITIES AND GRANITE COUNTER TOPS, ROCK FIREPLACE IN LIVING ROOM. FORMAL DINING ROOM, NEWER HARD WOOD AND CARPET FLOORING THROUGHOUT THE CABIN. FAMILY ROOM WITH FRENCH DOORS THAT LEAD TO A LARGE BALCONY GREAT FOR ENTERTAINING. DOWN STAIRS FEATURES A GAME ROOM WITH BUILT IN REFRIGERATOR. INDOOR LAUNDRY ROOM, TONS OF STORAGE THROUGHOUT THE WHOLE CABIN. WRAP AROUND DECK. 3 CAR GARAGE WITH DIRECT ACCESS. LARGE DRIVEWAY GREAT FOR PARKING. VIEW OF THE LAKE. LAKE IS STOCKED WITH FISH ALL THE TIME AND LAKE HAS A BEACH ENTRANCE." "Nestled in the beautiful small town of Green Valley Lake, this property has the PERFECT LOCATION. Only steps away from the lake, marina and town. This spacious 2760 square foot 4 bedroom, 2 bath home with a large unfinished attic is perfect for weekend getaways or as a full time residence. Enjoy the large dining room for entertaining during the holiday seasons with easy access to the open kitchen. Or snuggle up in front of the comfortable living room's wood burning stove to relax on this quiet cul-de-sac street. The main floor also offers a large master bedroom and bath with a walk-in closet, a large quest bedroom and a laundry room. Opportunities to expand the living space in this home are great with two staircases leading up to the large upstairs attic area. The two car finished garage and workshop provide easy ground level access and storage for seasonal equipment & supplies. While the exterior offers a wrap around deck for enjoying summer BBQ's and a ground level porch. Three additional driveway parking spaces with 10' X 30' RV parking capabilities. Green Valley lake and it's surrounding areas provide an abundance of outdoor activities including hiking, boating, fishing in the summer and skiing & sledding in the winter. 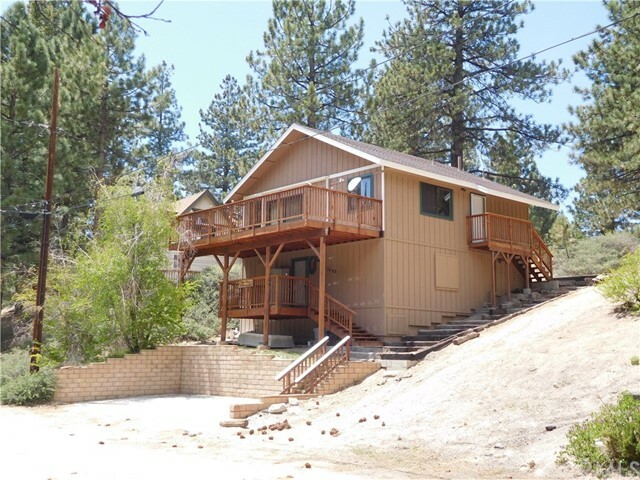 Only minutes away from Lake Arrowhead and Big Bear Mountain areas." "Amazing Log Home On Approximately 2/3 Acre Of Gorgeous Trees And Boulders Overlooking A Panoramic View Of Mountain Vistas. 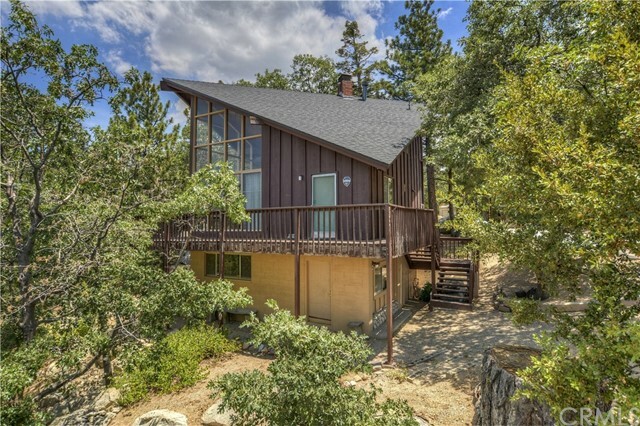 Tucked Away In A Quiet Corner Of Green Valley Lake, The Highest Town In The San Bernardino Mountains And Offers Everything You Could Want In Your Mountain Retreat. The Main Level Features The Living Area With Log Beam Ceiling And Floor To Ceiling River Rock Fireplace, Kitchen With Breakfast Bar, Walk-In Pantry, Dining Area, 2 Bedrooms And Full Bath. From This Level There Are Two Sliders Out To The Oversized View Deck To Enjoy Your Summer Barbeques And The Amazing Sunsets. Upstairs Is The Cozy Loft With A Wood Burning Stove And The Master Suite Complete With A Separate Entry, Walk-In Closet, Seating Area And Bath With A Jetted Tub And Separate Walk-In Shower. Downstairs With It's Own Entrance, Is The Game Room/Family Room, Walk-In Cedar-lined Closet And Bath 3 With A Walk-In Shower. From This Area There is Access To The Two Large Workshop/Storage Bays Which Can Also Be Accessed From The Exterior. The Grounds Offer Lots Of Opportunity To Enjoy The Boulders And Picnic Area Or Just Enjoy The Peace And Quiet Of This Lovely Area." "Surrounded by lake views and the massive former ski slopes of Green Valley Lake Ski Resort, this gorgeous custom, mountain home is awash with natural, flowing light. Beautiful vaulted beamed ceilings with two walls of windows. Easy access with only a few steps up to the front door and foyer. Step into the main level which includes an open floor plan, spacious living area, dining area, and large kitchen. There is also a bedroom and full bathroom on each level. Upstairs there is an informal den, Master Suite with private deck, and an office/sleep area. The lower level has a bonus room with bunk beds, and it's own bathroom. This is an ideal area for the kids to play video games and watch Netflix. The extra lot is included in the sale and has an even better lake view! All furnishings are available. Green Valley Lake is a small town, family friendly lake with swimming, fishing, and non-motorized boating available. It is a popular year round destination. There is plenty of snow in the winter months for kids to play, and the warm days of summer make for hours of splashing around in the lake. 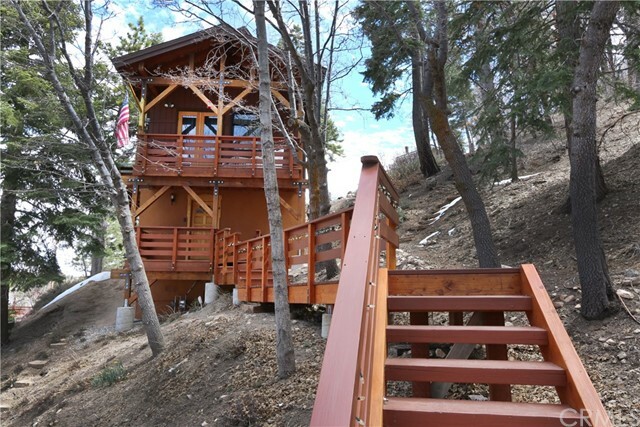 Start making new memories now and check out this beautiful mountain home." 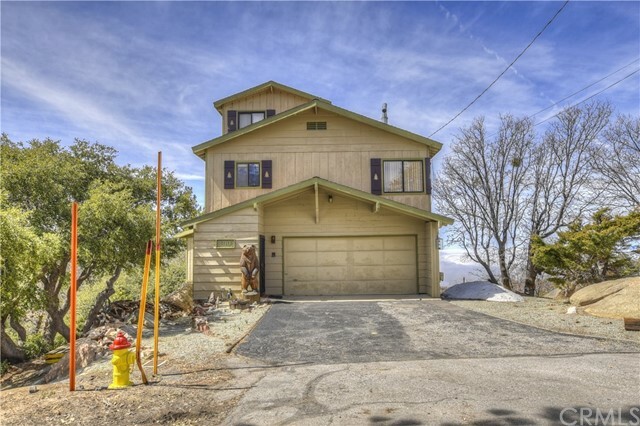 "This Impressive Two Story Remodeled Mountain Home is situated in the Quaint town of Green valley Lake with views of the mountains and trees. Upper level has a floor plan that's open to the Kitchen, Living room and Dinning area. The light and bright Kitchen offers a double oven, cook top stove, breakfast bar, Island, gorgeous cabinetry, side door that leads to the nice entertaining deck, dining area has a cozy brick fireplace, beautiful wood floors, high ceilings, lots of windows that bring in the natural light. Living room features recessed lighting, ceiling fan, T & G through-out and is spacious warm and comfortable. Lower level has a nice family room with a stone fireplace for those cold winter nights. Two bedrooms, 3/4 bath, laundry area, mud room and work shop and Plenty of parking for you and your guests, Just a short stroll to the Lake, Marina and Village." 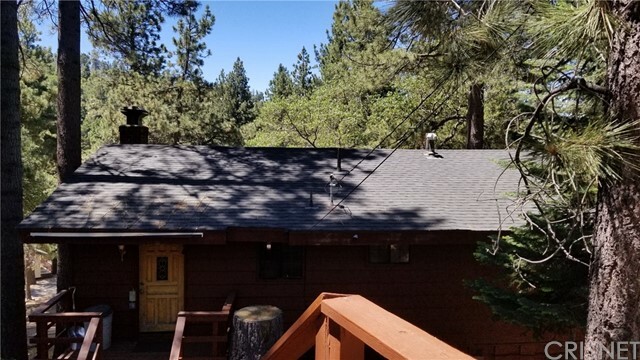 "This Mountain Retreat is tucked away in the quaint town of Green Valley Lake and sits on a treed lot that is Surrounded by boulders with a feeling of seclusion. Views of the Gorgeous Sunsets, city lights, mountains, desert, forest and trees from the large wrap around viewing deck and is great for entertaining. 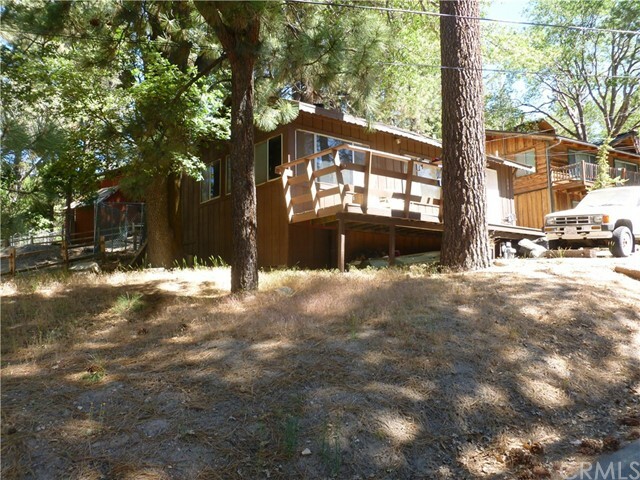 You can see Lake Arrowhead from the upper level of the cabin. This retreat features are: The entry level boosts an open floor plan with a galley kitchen, eating area, living room with wall to wall windows that bring in the natural light, high ceilings, stone fireplace for those cold winter nights, two side doors that lead to the viewing deck, 3/4 and hallway. Upper level has two loft bedrooms with an sitting area where you can just sit and enjoy the great outdoors. The lower level has a family room with it's own entrance, bedroom with a 3/4 bathroom, storage areas, utility room and Plenty of Level parking. Half of the lot to the left is included in sale." 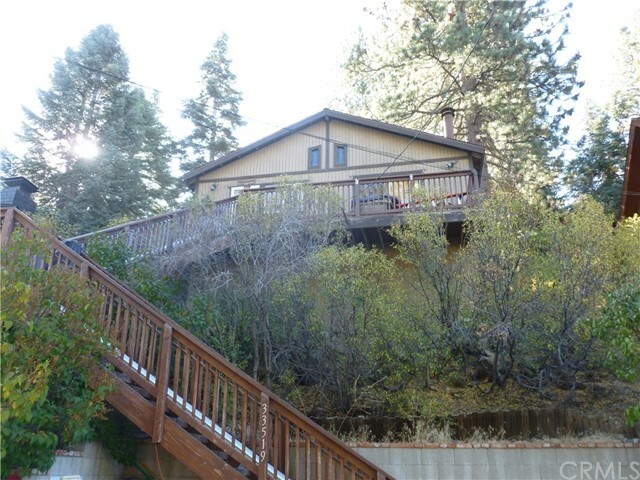 "This two story mountain cabin sits on two lots and backs the national forest. Features on main level are - wood floors & T & G throughout, high vaulted ceilings, log trim, kitchen with granite counter tops, breakfast bar, dining room with sliders that leads to the wrap around entertaining deck, Open floor plan, Living Room with sliders and a floor to ceiling fireplace, two bedrooms and a full bathroom. Lower level is the Master Suite with a 3/4 bathroom & Closet. Family room with sliders to the back yard, fireplace, Murphy Bed, Laundry Hook-ups. Adjacent lot to the right is included with sale. So close to the Village, Marina and Lake. Truly a must see"
"REDUCED 17K!! This fully remodeled Gambrel design home exudes classy, yet rustic, mountain charm. Listen to the natural stream that runs seasonally across the road. Spacious, level, dual access lot with plenty of level parking. Top grade finishes and quality materials were thoughtfully implemented throughout. Sureguard dual pane windows, Travertine marble floors, Eastern European Oak flooring, African Canyon Granite, Solid Alder Door. New plumbing, electrical wiring & sub panel, water heater, floors leveled, decks reinforced. All furnishings included, even the new 55 flat screen tv! This home is a one-of-a-kind head turner!! Within walking distance to Green Valley Lake, just over 1/2 mile. Green Valley Lake is a destination resort for avid hikers, mountain bikers and snow skiers. Snow Valley Ski Resort is within 7 miles. Big Bear, Lake Arrowhead and Santa's Village are all within an easy 20 minute drive." 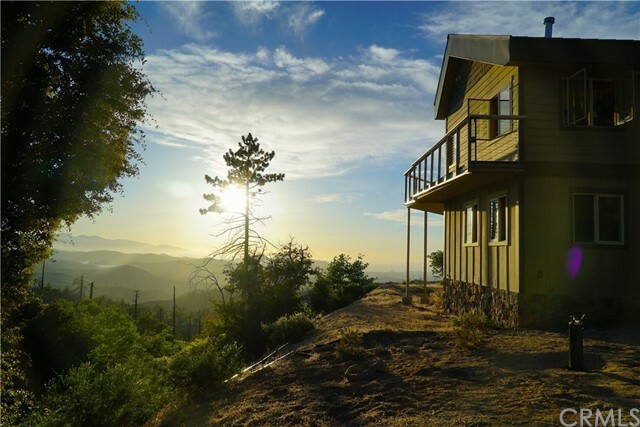 "This mountain retreat is perched among the trees giving you forest, mountain and sunset views from all 3 levels. Built in 2008 by a local custom artisan wood worker , this custom home offers an open concept kitchen to living room with rock fireplace and recess lighting. The master suite with luxury ensuite bathroom has a tile surround and a large soaking tub. The office nook and 1/2 bath is just off the living room. The dramatically place large windows allow natural light throughout the home from sunrise to sunset. The mudroom and laundry area provides ample storage space for tools, sleds , skis etc. A second bedroom has a separate entrance. A long blacktop driveway gives you plenty of parking and the 2 sheds give extra storage. Additional features include stainless steel appliances, butcher block countertops and a stainless steel topped center island. French doors and sliders open to the view decks. Ash wood flooring, T&G pine wood ceilings with tree stump pillar accents and other charming rustic touches make this unique home a truly MUST SEE!!" 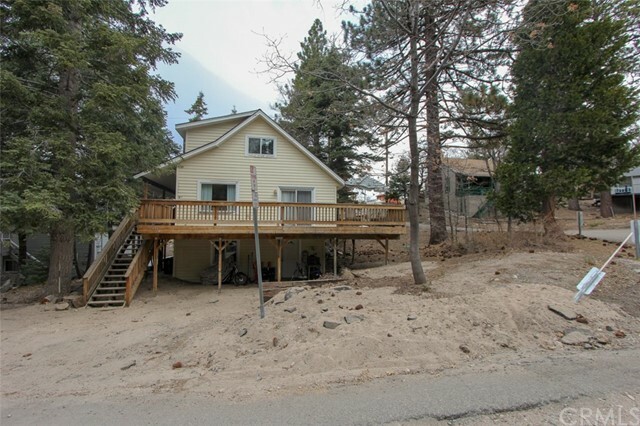 "Recently Remodeled Mountain Home in the Quaint town of Green Valley Lake with views of the Mountains, Forest, trees & just a short stroll to the Lake, Village and Marina. This two story mountain cabin features on the upper level is an open floor plan with a kitchen, dining area, living room with T&G throughout & high beam ceilings, brick fireplace for those cold winter nights, a large slider that leads to the nice entertaining deck and all new windows that bring in the natural light, Bedroom and a 3/4 bathroom. The lower level has two bedrooms, full bathroom, laundry room with plenty of storage and Level parking. Come up and enjoy the lake where you can fish, swim, kayak and maybe go for a hike in the forest. This cabin has a new roof, new decks, new siding on the right side, new front & back doors, new carpet and flooring throughout, new dishwasher. Level Parking. Seller is Motivated!!" 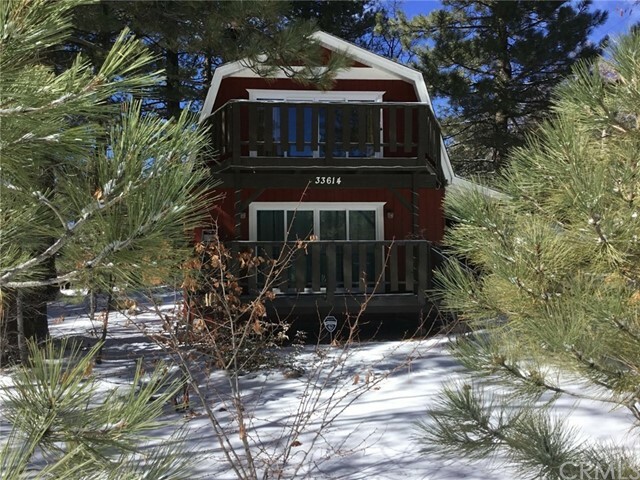 "This Level Entry Cabin is a perfect full time home or a great vacation get-a-way in the quaint town of Green Valley Lake and close to Snow Valley Ski Resort. This charming cabin has views of the Mountains, Trees and Forest. The features on the main floor are: Remodeled Cozy Kitchen with a butcher block island, breakfast bar, Dining area, Living Room with a brick fireplace for those cold snowy nights and High Beam Ceiling, bedroom, 3/4 bathroom, laundry hook-ups, utility area, coat closet and a slider to the back entertaining deck. Upper level has two bedrooms and one with a balcony, Jack n Jill bathroom with loft landing. Back deck to have your morning coffee and Plenty of Level parking. Close to the Village, Marina and Lake. Come up and enjoy what the mountains have to offer." 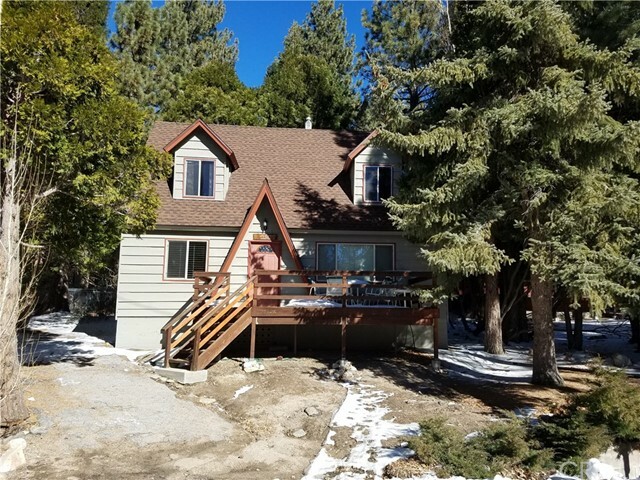 "This 3 level mountain cabin is a perfect full time home or a great vacation get-a-way in Green Valley Lake, a beautiful mountain lake village, located in San Bernardino Mountains between Big Bear Lake and Lake Arrowhead, at an elevation of 7,200 feet. The house is only couple minutes walk to the lake, store and restaurants. Come up and enjoy the lake where you can fish, swim, kayak and maybe go for a hike in the forest. 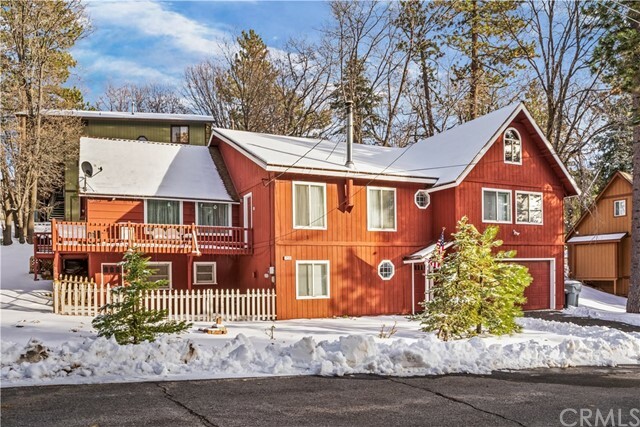 The house is close to hiking trails and just a few miles to ski resorts. This house has a parking deck in the back and a large patio. The ground level has a family room with a fireplace and 2 bedrooms and a separate laundry room. The middle level has a spacious living room with lots of large windows that allow natural light, a fireplace, kitchen, 1 full bath and 1 half bath and access to the patio. The top level is a finished 392sqft large bedroom attic ,it can be accessed from the inside, the middle level of the house or a separate entrance from the outside." "Charming A frame located in Green Valley Lake includes 2 bedrooms, 2 bathrooms, open kitchen and living room w/fireplace, wood flooring and wall of windows for a light/bright setting & large deck off the living room for entertaining. Adjacent Lot 45 included, allows for additional parking, play area for the kids, expand the existing home or build another for family and guests (See survey markers), all appliances included, fenced area for pets & storage shed in back. This would make a great vacation rental, part time or full time home. DISCLOSURE: Square footage, Lot Size & other information obtained from county records are approximate & not guarenteeed by the Broker. Buyer to verify all information from county records." 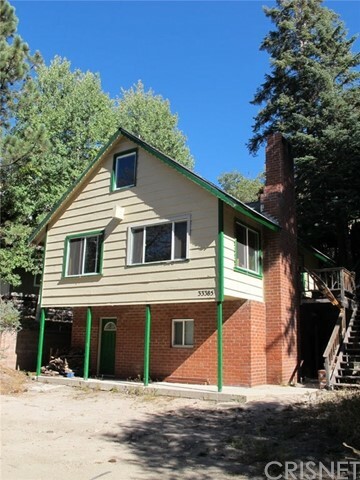 "Check out this wonderful Green Valley Lake home that is ACROSS THE STREET from National Forest and is walking distance to town and the lake. The main living level (middle level) has the galley kitchen, very large living room, large deck, and full bath. This house is great for entertaining! Up stairs has a small bedroom, large bedroom, and half bath. Downstairs you will find the large laundry area and very large bedroom or game room and access to the dirt buildup area." 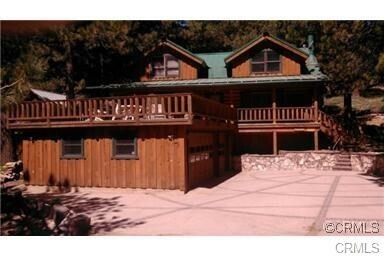 "Located at 7000 feet in the quaint village of Green Valley Lake is this 4 bedroom 1 bath mountain cabin. Deck off the back for sitting and enjoying the views. Inside vaulted open beam ceilings and knotty pine. Kitchen has plenty of cabinets and counter opens to dining and living room with brick fireplace. 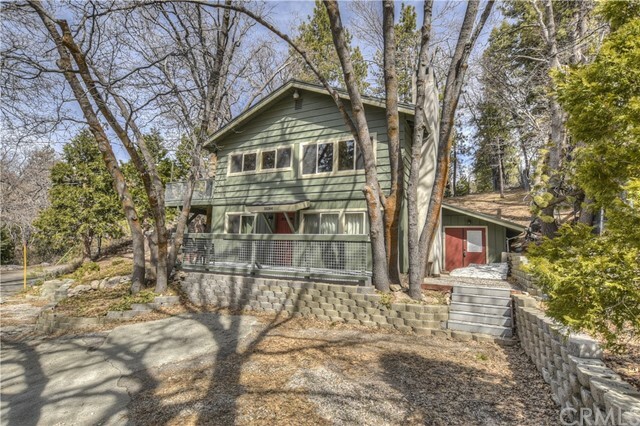 French doors open to the back deck .Surrounded by National Forest and near ski hills, hiking trails and shops and restaurants at Lake Arrowhead and Big Bear. Walking distance to lake. Lake is stocked on a regular basis with game size trout. 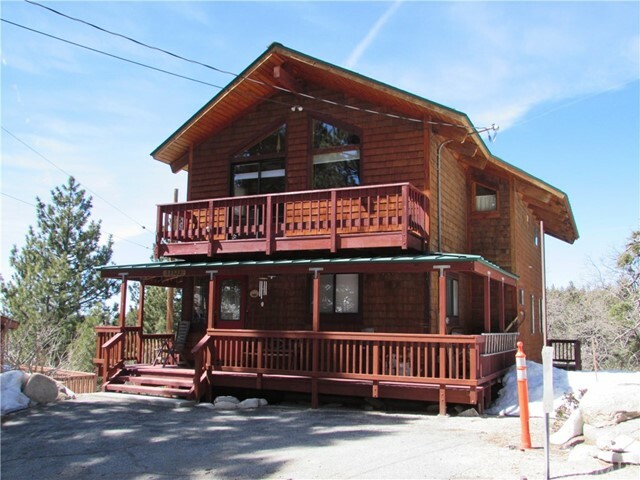 Big Bear resort and Snow Valley are a short drive away. Extra lot included"
"Price REDUCED! This adorable cabin has been host to decades of memories for the sellers and their family. Now it's time to make your family's memories there! With an outstanding location and easy level access, this property is set up for easy enjoyment. Three bedrooms (or two and a family room/game room), one full bathroom and one half bathroom, galley kitchen and large dining area provide room for everyone at once, while still providing a cozy get away for just yourself on other occasions. There's been a forced air unit installed to keep the place warmer and every aspect of the home has been carefully maintained so that it is ready for your enjoyment on day one. Furnishings can stay so that all you have to do is bring your suitcase! The town of Green Valley Lake provides year round mountain fun for outdoor enthusiasts and those just wanting to escape everyday hustle and bustle. Hiking, sledding, fishing, kayaking and swimming can all be had just a short walk from this cabin. Don't miss this special place!" "This two story + loft mountain cabin features level entry, an open floor plan, with a kitchen, dining area, living room, deck, and full bath on the main level. T&G throughout with high cathedral ceilings and a wood burning fireplace for those cold winter nights. In the lower level you ll find a bedroom, full bath, along with a family room which walks out to a concrete patio area. Furnishings stay just bring your toothbrush! The town of Green Valley Lake, provides year round mountain fun for outdoor enthusiasts. Hiking, biking, sledding, fishing, kayaking, and swimming can all be had. The Mountain Ski Resorts are also close by. The local lake itself is only a short walk from the cabin. Don't miss this special cabin and all that GVL has to offer!" "If You're Tired Of The Congestion And Noise In The City, Come To This Quiet Little Corner Of Green Valley Lake! Located 4 Miles Off Of the Main Mountain Roads, Green Valley Lake Is The Highest Town In The San Bernardino Mountains, Completely Surrounded By National Forest With A Picturesque Lake For Fishing, Swimming, Paddle Boating And Kayaking. 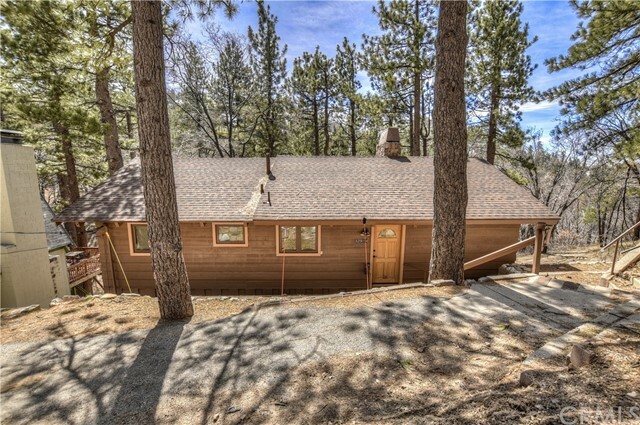 This Affordably Priced Cabin Is The Perfect Place To Call Your Retreat! Lots Of Level Parking With Level Entry Too And A Covered Front Porch To Greet You. The Main Level Features The Living Room With Beamed Ceiling And A Wood Burner Stove, 1 Baths And The Kitchen With Laundry Area. From This Level You Can Access The Rear Deck. Upstairs Are 2 Nice Size Bedrooms With Open Beam Ceilings. 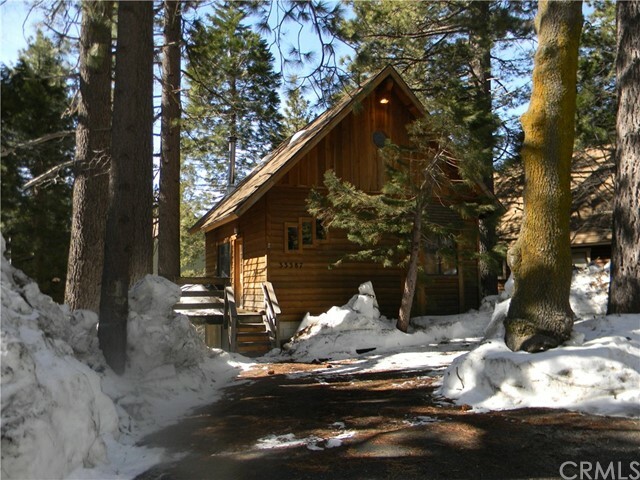 This Cozy Cabin Comes Furnished As Well So All You Need To Do Is Come Up And Enjoy!" 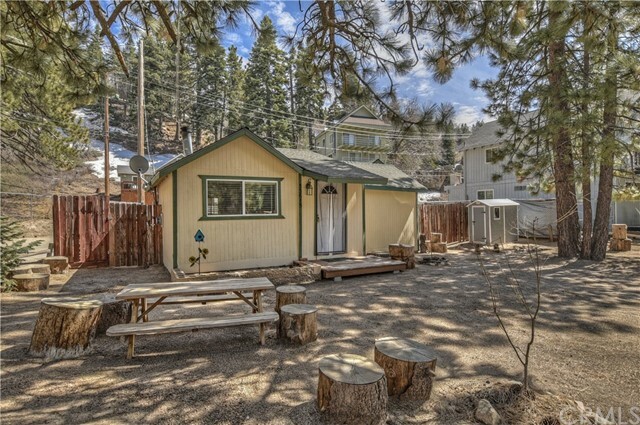 "Cute and charming 2 bedroom 1 bath cabin sits above the street giving it a tree house feel. Nice hard wood flooring and vaulted ceilings. Nice fireplace to keep you cozy warm.The bedrooms and bath are just a few steps to second level. Composition roof is approximate 5yrs old. A driveway for off street parking and a possible workshop area under the house. Located on the first street to be plowed in the winter, it is also close to the lake and village. Also has chair lifts on all stairs. A great affordable opportunity to own a cabin in beautiful Green Valley Lake." "Super cute cabin in the woods. Level parking for three or more cars. New roof and new paint. T&G through out. Beautiful fireplace for those cold winter nights. Two Bedrooms and one full bath. Bright breakfast nook to enjoy meals or play games. Great deck for summer BBQ`s or just to relax. Laundry room. Close to town, marina and lake. Lots of great things to do in Green Valley Lake !" "Come up and make this Tiny Cottage your weekend Get-a-way. 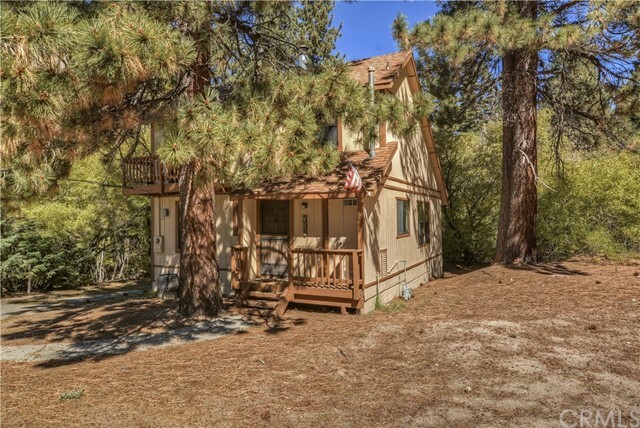 This cozy cottage is tucked away in the San Bernardino Mountains in the town of Green Valley Lake. It features a Living Room with wood floors, a wood burning stove, wall heater,one bedroom with a wall heater, slider door, full bath, kitchen, breakfast bar, laundry area, there is an outside Studio with a loft or it can be a Bunk room. The back deck welcomes you where you can just sit and enjoy the fresh air or simply just sit with your favorite book and beverage and soak up the sun. Green Valley Lake offers swimming, boating, fishing, hiking, kayaking and during the winter it's just a short drive to Snow Valley for your winter sports. Plenty of level parking for you and your guests." "Lots of potential for this cute GVL cabin. 1 bedroom and 1 full bath cabin with a nice size room off the kitchen that can be used as another bedroom. Nice freestanding fireplace .Plenty of off street parking. There is an area in the yard that is fenced in for Fido. Affordable .. Come take a look ..."